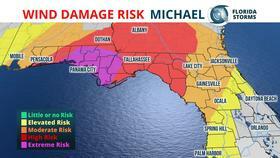 Hurricane Michael continued to strengthen Monday afternoon, and with a forecast becoming more certain of a direct hit, a Hurricane Warning was issued for the entire Florida Panhandle. A Storm Surge Warning was also issued from the Emerald Coast to the Nature Coast, where a life-threatening inundation of water is now likely. Hurricane Hunters found that Michael had strengthened a bit Monday evening. As of the 8 pm advisory, the National Hurricane Center said the season’s seventh hurricane was near the western tip of Cuba and producing winds up to 85 mph. 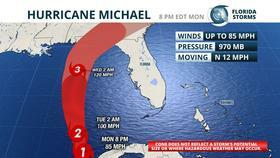 Michael had accelerated a bit and was moving north at 12 mph. There has been little change to the track forecast for Hurricane Michael over the past 12 hours. Forecasters from the National Hurricane Center continue to suggest they have relatively high confidence in a landfall somewhere between Destin and Apalachicola. However, timing of this landfall is still a bit in question due to model differences on the forward speed of Hurricane Michael beyond Tuesday. The GFS, for example, brings Michael well inland by Wednesday afternoon. In contrast, the European model is much slower and doesn’t bring Michael inland until early Thursday. If a slower solution materializes, it is possible Michael could weaken some before landfall and even turn a little to the northeast, placing more of Florida’s Big Bend and Nature Coast in line for direct impacts. The average track error at landfall, which is about 48 hours from the last advisory, is about 74 nautical miles from the center. Potential impacts from Hurricane Michael are likely to spread up to 200 miles from where the eye makes landfall, especially on its eastern side. As of the 8 pm advisory, tropical storm force winds were already extending up to 175 miles from the center. Other storm surge inundation forecasts include 6 to 8 feet from Cedar Key to Crystal River, 6 to 8 feet also from the Okaloosa/Walton county line to Indian Pass, and 4 to 6 feet from Cedar Key to the Anclote River. 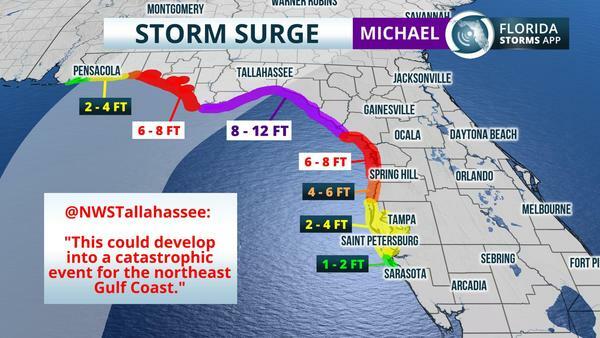 A 2 to 4-foot surge will be possible along the coast further south in to the Tampa Bay metro area, and further west to the Alabama/Florida border. The Hurricane Warnings are issued when winds of 74 mph or greater are possible during the event, but also when tropical storm force winds are likely within 36 hours. When the latter arrives, it will make completing hurricane preparations nearly impossible. Due to the aforementioned uncertainties of the storm’s eventual intensity, track and structure, how extreme the winds may get at any particular location is still a bit difficult to pin down.